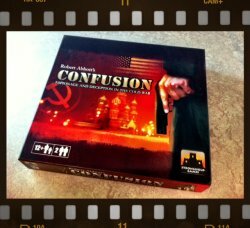 Confusion is a two player game, designed by Robert Abbott, first published in Germany by franjos Spieleverlag in 1992. It has recently been republished by Stronghold Games in 2011, and I will review this edition of the game. 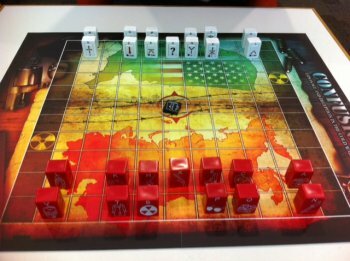 The theme of the game is the Cold War. Spies from the USA and Soviet Union are battling for control of a briefcase of documents, which will ensure the safety and security of their country. Each player controls thirteen spies, which they move across an 11 by 11 square gridded gameboard. The components in the Stronghold edition are stunning. A large, attractive box contains a nice game board, two huge deduction folders, rules in four languages, dry erase marker pens, and the spy pieces. Everything looks gorgeous, but the spy pieces are amazing chunks of some bakelite-type substance, resembling red and white Mah-Jongg tiles. Each of these spy pieces has a deep recess in them, into which a movement piece snugly docks. Each spy has a letter identifying them. 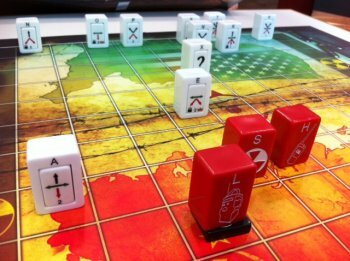 Players set up their spies in pre-determined spaces according to the rules. They line up along the back two rows of their side of the board, in chess like fashion. The interesting thing with this game is the recess side is turned away from the owner, and a movement piece is randomly inserted into the recess. 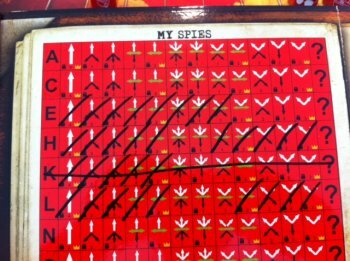 The outcome is although spy "C" always begins in the same location on the board, it will have a movement piece randomly inserted into it. These movement pieces dictate the legal moves of that particular spy, and no two are the same. The catch is the owner doesn't know what is a legal move and what isn't. Through trial, error and deduction, they have to quickly form a picture of what their spies can and can't do - all while trying to win the game, and not lose it! Game play is very simple. 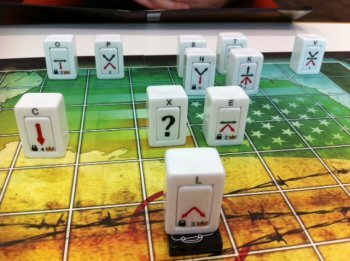 On a turn, the player selects one of their spies and attempts to move it in a straight line - forwards, backwards, laterally or diagonally. Their opponent, who can see the legal moves for that spy, then either says "yes" (a legal move), or "no" (an illegal move, the spy is returned to it's starting location). Every move tells the owner something about the spy, which is recorded on the deduction folders. If a spy legally moves onto an opposing spy, that piece is captured and removed from the board without being revealed to the owner. If a spy moves onto the brieifcase, which begins in the centre of the board, it can be picked up and carried along with the spy. On future turns the case can be moved, dropped, or even thrown - usually to a friendly spy who catches it. Four of the spies, the ones with severely restricted movement options, can be promoted to a powerful "2 in any direction" piece. Such upgrades are akin to queening in chess, and one of these spies can quickly destroy several opposing pieces. The game ends when one player has moved the briefcase down to their opponents end rank on the board, and they win the game. Games can take anywhere from 20 minutes, up to an hour. As players get more experienced, games tend to take longer, but it's certainly possible to have the occasional quick game. Confusion also comes with a small sheet of special action tokens that can be added into the game, allowing double moves, piece swaps and so on. They can be used to spice up the game, or added in as an excellent handicapping device when the matchups are uneven. The rulebook also includes several variants, such as removing the left and right most files on the game board, creating a narrower playing area. I thoroughly enjoyed Confusion. Players race to quickly build a picture of what their pieces can do, while trying to set the board up to allow both attacking and defensive play - in the most efficient way possible. The deduction element works very well here, and you don't feel overburdened trying to solve a logic problem, while resolving on board tactical problems at the same time. As pieces close in on the briefcase, the tactics begin to focus on risk management - this is because you don't have a complete picture of what your spies can do, so you're forced to gamble and play the odds, hoping a particular move will come off. Any problems with the game? I couldn't see any - some people may be turned off by the chess like tactical element, but I found the deduction/risk management elements boosted the fun. My copy had some production flaws - the red pieces needed some work with a white crayon to fill in some of the missing paint. Also, my white deduction folder appears to have a printing error, where a couple of red arrows are missing on one of the rows. Neither of these are show stoppers. 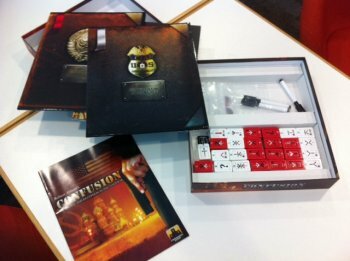 Confusion is an excellent game, combining light deduction elements with a chess like mechanics, but producing a game that feels rather unique. I can't think of another game like it, and these days, different is good!